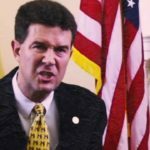 Secretary of State John Merrill of Alabama co-sponsored the state’s voter ID law when he served in the state legislature. He also defended Alabama’s decision to close 31 DMV locations in predominately African American neighborhoods after the bill became law. Secretary Merrill also alleged that over 700 people voted illegally in the Republican Senate primary runoff election, a claim that was proven false after further investigation by Alabama probate judges.